Beyond Yourself’s INFUZER Series allows you to become your very own “WHEYOLOGIST”! As an industry leader known for making great tasting products, we at Beyond Yourself want you to take our flavours to a whole new level. For every 84 serving (5.28lbs) tub of INFUZER ISOLATE (WPI90), you get two mouth watering FLAVOUR INFUZER packs. With 7 mind-blowing flavours to choose from, you can mix and match flavours or alternate flavours in your daily shakes to avoid the boredom that comes with committing to 5lbs of the same old thing. Whether you mix our mouth watering INFUZER packs into our INFUZER ISOLATE for a great tasting shake, or use them for baking, oatmeal, coffee or yogurt, you easily control your own flavour! Everything taste better with Beyond Yourself’s FLAVOUR INFUZER! 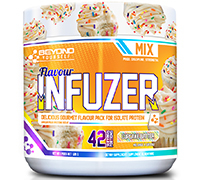 Mix 1 to 2 scoops of BEYOND YOURSELF INFUZER ISOLATE with the BEYOND YOURSELF FLAVOUR INFUZER OF YOUR CHOICE once daily (or as required to meet your daily protein requirements) with 8 to 16 oz of cold water (8oz of water to each scoop) immediately before consuming and blend with a spoon or use a shaker bottle. Consume within 90 minutes of exercise. Beyond Yourself is a dynamic Canadian company born out of a passion for the supplement industry. Our mission is simple: To produce quality, great tasting products geared toward people from all walks of life who take their health seriously. Though trends in the market often lean toward promising insane and impossible results, at Beyond Yourself our approach is different. We believe that hard work and discipline combined with our high-quality products will ensure that you will have all the tools necessary to truly go BEYOND YOURSELF! Providing high quality/great tasting products our customers actually enjoy taking. Recommended Use: for use as a flavour pack with Beyond Yourself's Infuzer Isolate or in your favourite baking recipes, oatmeal, yogurt etc. 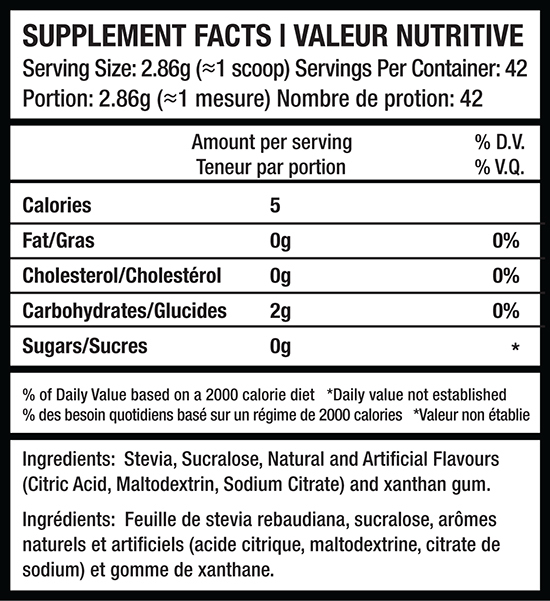 Directions: Mix 1 scoop (3g) of Flavour Infuzer with 1 scoop of Infuzer Isolate + 6 to 12 ounces of cold water and consume.